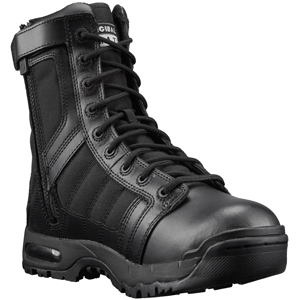 The Original SWAT Metro Air 9in Side-Zip Tactical Boot 123201 uses "air" technology that adds to your comfort level. This boot is ideal for long duty shifts and extended duty on the pavement and asphalt. Equipped with only non-metallic components, the Metro Air 9" Side-Zip is the x-ray friendly and is the perfect boot for security details and law enforcement. A convenient side zipper keeps entry and exit fast and easy. This boot was desinged with comfort in mind and features a removable custom fit EVA insole, a custom-molded phylon EVA midsole for lightweight comfort and cradled support, a Texon stability platform for lateral support and torsional rigidity, and a custom-molded thermoplastic heel counter and toe box for instant comfort and lateral support. A visible heel air cushion uses the absorptive qualities of air pressure to mitigate shock and vibration to fight fatigue and keep you going all day long.